Remodeling offers the opportunity to make some big changes! 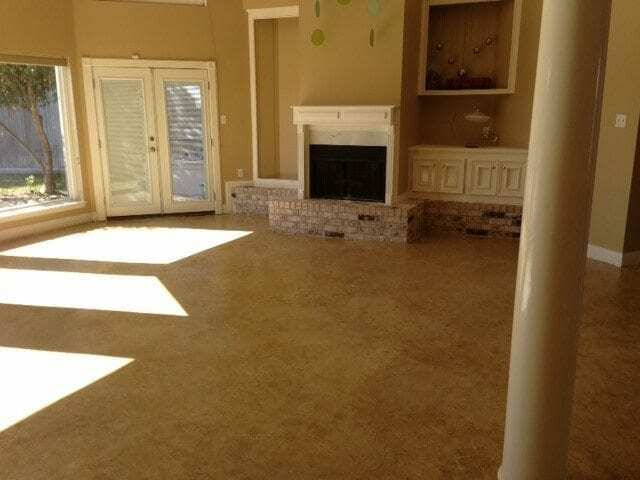 Often, when it comes to flooring, the typical options are considered: wood, tile, or carpet. If it’s a high traffic area (or even if it’s not) low maintenance is usually desired…something easy to Swiffer when in a pinch. Why not add another option to the choices? Stained concrete offers durability and low maintenance and can be offered in an almost endless array of colors and designs. The end result will always be one-of-a-kind! Spencer Lippincott, with All Out Construction, of Houston, Texas provided these two examples of variations of stained concrete floors. They were both done in remodels but entailed two different procedures. The dramatic darker example of stained concrete flooring was a straight-forward two day project. First, the natural concrete was prepped with a diamond scrubber, to remove any roughness, and cleaned with SureCrete Design Products’ Super Concrete Renovator (SCR). Next, Burnt Crimson and Espresso Eco-Stain, each at 100% strength, were applied by spraying to achieve subtle tonal changes throughout the floor. Finally, a durable, high-gloss shine was achieved by sealing with SureCrete’s Dura-Kote Water Based Polyurethane; it will easily withstand the wear and tear of a household for years to come. The subtle but eye-catching lighter example of stained concrete flooring entailed a bit more prep; the week-long project started with the removal of old tiles. The floors were then ground and cleaned with SCR. A scratch coat of Sure Spray was squeegeed on with a magic trowel, allowed to dry and was sanded. Then, for the finish coat, Micro Topping with Integral Color in Sun Buff was applied with a pull trowel for a smooth surface. The variegated look was accomplished with an application of Kodiak Eco-Stain (diluted 2 to 1) with the use of a sea sponge – just that process that took All Out Construction two days! 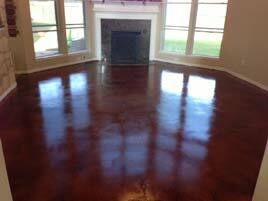 As with the other, this stained concrete floor was sealed with Dura-Kote Water Based Polyurethane. So, if considering a new floor for an upcoming remodel, take a fresh look at unique and durable stained concrete flooring.